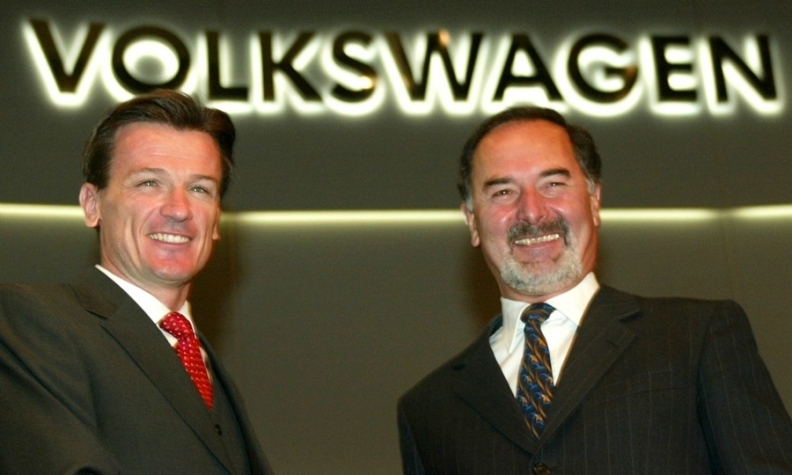 Former VW CEO Bernd Pischetsrieder, right, and Wolfgang Bernhard, pictured in 2005, wanted the company to partner with Daimler. FRANKFURT -- Volkswagen Group might have stayed clear of the diesel cheating that led to the worst business crisis in its history had the company not pulled out of a promising deal with Daimler more than a decade ago. Led by former CEO Bernd Pischetsrieder, Volkswagen examined strategic options for tie-ups and cooperation projects in 2005, a time when the company was undergoing painful restructuring. The deliberations included senior-level talks on a possible deal with its German rival that would have given it access to Daimler's diesel technology and could have even included cross-shareholdings of about 10 percent, according to people who were involved in the discussions. But Volkswagen abruptly called off talks that year, instead forging ahead with its own diesel systems which proved incapable of meeting strict U.S. emissions standards. Faced with an aggressive management push to finally achieve a turnaround in the U.S., the maker of Golf and Jetta cars resorted to secretly rigging its engines until regulators blew open the scheme in late 2015, hammering the once-proud German manufacturer with about 20.5 billion euros ($21.8 billion) in clean-up costs and leaving its reputation in tatters. Talks to advance the top-secret project, dubbed "Table Mountain," were canceled by Volkswagen before a key meeting near Brunswick, Germany, in summer 2005, said the people, who asked not to be identified as the plan was strictly confidential. That's several months before the first indications that Volkswagen engineers were working on the defeat device that eventually rigged 11 million vehicles worldwide to cheat on emissions tests. The scheme unraveled in the summer of 2015 when U.S. authorities pressed Volkswagen to explain why on-the-road emissions of smog-inducing nitrogen oxides were as much as 40 times over the legal limit in cars that met standards in test labs. In addition to fines and costs for fixing or buying back the tainted vehicles, at least six company officials face charges, including former board member of the namesake brand Heinz-Jakob Neusser. Volkswagen also pleaded guilty to conspiracy to defraud the U.S. government and obstruction of justice. A deal with Daimler, which owned Chrysler when the talks were under way, could have thwarted the disaster by offering access to the Mercedes-Benz parent's BlueTec diesel technology, which uses a urea solution to clean up harmful emissions. But Volkswagen balked at using BlueTec, because it would have added about 1,000 euros per car to install and the manufacturer struggled to lower production expenses sufficiently to compensate, according to the people. VW and Daimler officials declined to comment on the past discussions. Pischetsrieder and former VW brand chief Wolfgang Bernhard, who had joined from Daimler and championed the use of the Stuttgart company's technology, have offered to make an affidavit that they were not involved or knew about the development of illegal engine software. Calling off the talks with Daimler sparked controversy within Volkswagen's top management at the time. One area of concern was that U.S. emissions limits could prove difficult, if not impossible, to reach without Daimler's BlueTec, according to the people. First prototypes of VW's EA189 engine, the motor at the heart of the diesel scandal, were shown internally to executives during 2006, they said. One significant result in the wake of these talks was a production agreement involving the Mercedes Sprinter and the VW Crafter delivery vans. Daimler let the contract expire at the end of 2016 to use the capacity for its own expansion. Volkswagen and Chrysler, which is now part of Fiat Chrysler Automobiles, cooperated on the VW Routan minivan for the U.S. between 2008 and 2013. Any prospects to revive a deal have long since ended. In 2006, Pischetsrieder was ousted as CEO by former Chairman Piech. He then installed confidante Martin Winterkorn, who stepped down in the wake of scandal. Bernhard left in January 2007 and has since rejoined Daimler. Volkswagen officially presented the EA189 diesel engine in 2007 and started using it in cars in the following year. Under the agreement with U.S. authorities, Volkswagen agreed to improve compliance systems, enhance whistle-blower programs and appoint an independent monitor for three years.